You can have various combinations of the Zen indoor units connected to the MXZ-3F54VF outdoor unit which uses the latest R32 refrigerant. This is an extremely energy efficient multi outdoor unit with a COP rating of over 5.0. 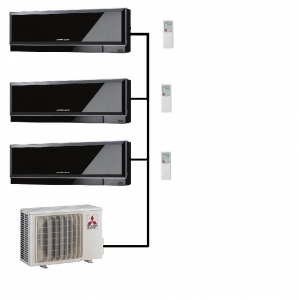 The stylish Zen indoor units are one of the best looking indoor units on the market and are built to a quality that you would expect from Mitsubishi Electric. They have features such as the quiet operation with virtually no audible fan noise when operating. The nano platinum filter fitted on these models deodorizes and neutralises any bacteria in the air to give you a constant supply of clean air. Unlike most other manufacturers models the system also has a weekly timer function.